Glenn Beck has been proudly displaying his honorary Doctorate in the Humanities given to him for speaking at Jerry Fawell Jr.'s Liberty University. Beck is self taught after taking one college course on theology at Yale while working at a local radio station. Beck has said that he named his online school "Beck University" because he wanted to make a commotion among "people"...to get attention, to become more famous, to make more money. He's a clever businessman with a method that works: be controversial. online education toward what end? A look back at Glenn Beck's previous claims and arguments can help bring his new project, Beck University, in a sharper focus. To that end, the following is a reprint of a 7/7/10 press release from Media Matters, a progressive fact finding organization and watchdog of conservative media. Their counter-parts are Accuracy in Media (AIM). Readers who can challenge the accuracy of Media Matters for America's facts are encouraged to do so in comments below. The Glenn Beck Review is interested in both the facts assembled into an accurate depiction or story and differing perspectives on Glenn Beck. For more on how perspective weighs on fact, see "The truth about Glenn Beck." To that end, the Glenn Beck page at Wikipedia has been updated and much improved, now describing much of his supporters' perspective on Beck. Challenge what is written there in that revised biography and bring any issues about that page's content back to The Glenn Beck Review. Is it a fair story being told on that user-built encyclopedia or not? Comment below. Is The Glenn Beck Review being fair in its findings? Based upon the facts, analysis and a perspective, direct action is also advocated by this Review. Call Fox and complain. Call his boss, Rupert Murdoch, and complain Sign a petition. That's been the strategy to date. New idea: stand behind the windows at Fox on Founders Fridays protesting, pound on the windows and dissent. Do so only with an understanding of what is going on inside. The contents link above offers an organized pamphlet of Beck in Review. Glenn Beck has touted his online Beck University "academic program" as a "unique academic experience bringing together experts in the fields of religion, American history and economics." But Beck's history of bizarre claims, distortions, and downright false statements on a variety of subjects might make a potential student think twice about enrolling at Beck U. This July, while others are relaxing poolside, head back to the classroom -- from the comfort of your own home. That may sound like an oxymoron but Glenn's new academic program is only available online. Offered exclusively to Insider Extreme subscribers, Beck University is a unique academic experience bringing together experts in the fields of religion, American history and economics. Through captivating lectures and interactive online discussions, these experts will explore the concepts of Faith, Hope and Charity and show you how they influence America's past, her present and most importantly her future. Beck promotes kickoff of Beck University. On the July 6 edition of his radio program, Beck hyped the kickoff of Beck University, stating, "Beck University is clearly not a university," adding however that "other universities are going to be tied to Beck University. They're going to be providing actual classes." On his July 6 Fox News program, Beck further promoted Beck University, explaining: "I added a new feature: It's Beck University. We call it that because it drives people crazy. It includes lectures -- a series of lectures from just really bright minds. Right now, we're talking about faith, hope, and charity. We have David Barton. We have -- just -- it's great stuff. Starts tomorrow. We have to protect our country's future by learning from the past." 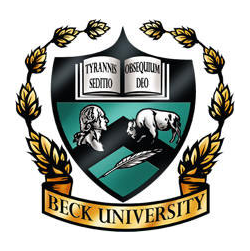 Media Matters has compiled a lengthy list of counter-factual and ahistorical claims Beck has made on a variety of topics in order to explore what Beck University's course offerings might look like. Civics 100: Public and Private Entities: All "the same stuff." On his January 28 Fox News show, Beck asserted that "Fannie Mae and Freddie Mac" are "who the government uses to handle all that money and give everybody loans." He later clarified: "Fannie does student loans, Freddie does not, but Fannie does, and Sallie [Mae] does. But, I just -- the reason why I lump them all together is because mom, dad, child: I mean, it's the same stuff." Of course, they're not all "the same stuff:" Fannie Mae and Freddie Mac are government-sponsored entities that operate in the home mortgage market while Sallie Mae -- the SLM corporation -- is a publically traded for-profit corporation that offers several types of educational loans. Sallie Mae terminated its government charter and completely privatized in 2004. Fannie Mae, furthermore, is not involved with student loans. Civics 300: Taxation and the Federal Reserve. During his January 13 interview of Sarah Palin, Beck complained that "nobody's having hearings" on the Federal Reserve's record profits last year, and "nobody is looking for a windfall profit tax on the Fed, we can't even open the Fed's books." What Beck apparently didn't know is that all of the Federal Reserve's profits already go to the Treasury -- the "windfall profit tax" Beck sought is already effectively at 100 percent. History 200: A "Second Bill of Rights." On January 11, Beck falsely claimed that President Franklin Roosevelt, in support of a "second Bill of Rights," "was pushing for a change to the Constitution." Beck added that "progressives," such as Office of Information and Regulatory Affairs Director Cass Sunstein, have "been pushing for the second Bill of Rights since FDR" and cited this as evidence that such progressives "know" that health care reform is "unconstitutional." However, in the interview Beck cited, Sunstein made clear that he shared Roosevelt's view that he "didn't want to change the text of the Constitution." History 250: Cloward and Piven. Beck frequently references the so-called Cloward-Piven strategy, which calls for an overloading of government-provided services to force the government into providing a "national income" for every citizen, a strategy advanced by Columbia University sociologists Richard Cloward and Frances Fox Piven in a 1966 article forThe Nation. On November 3, 2009, Beck implored his viewers to Google the Cloward-Piven strategy, explaining (accessed via the Nexis database): "This is important, because Cloward and Piven, the Cloward and Piven strategy, it's what they're doing. They're collapsing the system and replace it with a system of guaranteed annual income for all the workers! Workers of the world unite!" Beck has adopted "Cloward and Piven" language for use in a variety of accusations of underhanded dealings, employing it to falsely characterize the Community Reinvestment Act, criticize BP oil spill cleanup operations, and suggest that George Soros is attempting to "replace the capitalist system." History 300: History of Communism in the U.S.: McCarthy "was right." Beck often purports to identify a link between progressivism and communism. For example, he complained on his June 24 Fox News program that children "are not being taught the evil of communism and socialism," which enables progressives to "mutate it" so that it "goes undercover." In explaining the "evil[s]" of communism, Beck has repeatedly stated that Joseph McCarthy was "right," and he agreed with Human Events contributing editor M. Stanton Evans that McCarthy was "telling the truth." History 350: Revolutionary Rhetoric. Despite criticizing others for their use of violent or revolutionary rhetoric, Beck frequently uses such rhetoric himself, once stating that "there will be rivers of blood if we don't have values and principles." Warning that "the revolution of 1776 was a picnic compared to what the revolutionaries of today would like to do," he asserted that "usually, millions of people die." He has told his audience that "we are being pushed" toward civil war and that Obama is "trying to destroy the country." He has also told Fox News host Bill O'Reilly that "trouble is coming" and that "it will be the French Revolution, not the American Revolution." Required Reading: The Red Network's anti-Semitism and racism. Beck praised Elizabeth Dilling's book, The Red Network, for its illumination of the "communists in America." Dilling's book asserts that "un-Christianized" "colored people" are "savages" who owe their success to Christian whites; blames "revolutionary Russian Jews" for German anti-Semitism; and suggests that Hinduism and Islam are "debasing and degrading" and that Judaism and Hinduism spread "propaganda." The book says that "it is only fair to note" that Germany's Jewish population contained "Russian Jews" who "had made themselves prominent in the Red movement," and if Germany "has discriminated against the innocent also, it has been with no such ferocity and loss of life as the planned and imminent Communist revolution would have wreaked upon the German population." Required Reading: "Factional" novel The Overton Window. Beck has hyped his novel, The Overton Window, as "faction," which he defines as "completely fictional books with plots rooted in fact." Despite overwhelmingly negative reviews for the supposed "thriller's" absence of a thrilling plot, Beck has claimed that "[w]hat makes this thing a thriller and terrifying is the fact that it is, a lot of it, happening." Indeed, the conspiracy theories in the book track closely with conspiracy theories Beck has talked about on his show. Required Reading: The 5000 Year Leap by discredited author W. Cleon Skousen. Beck has repeatedly endorsed the book The 5000 Year Leap by W. Cleon Skousen, an author described by Salon's Alexander Zaitchik as "not a historian so much as a player in the history of the American far right" and "less a scholar of the republic than a threat to it." Another book by Skousen, The Making of America, states that slavery is "not a racial problem" but is rather "a human problem." Zaitchik wrote of The Making of America: "Toward the end of Reagan's second term, Skousen became the center of a minor controversy when state legislators in California approved the official use of another of his books, the 1982 history text 'The Making of America.' Besides bursting with factual errors, Skousen's book characterized African-American children as 'pickaninnies' and described American slave owners as the 'worst victims' of the slavery system. Quoting the historian Fred Albert Shannon, 'The Making of America' explained that '[slave] gangs in transit were usually a cheerful lot, though the presence of a number of the more vicious type sometimes made it necessary for them all to go in chains.' "
Science 100: The Fallacy of Global Warming. Beck falsely claimed that there has been "zero warming for over a decade" and that climate change is a "scam" and has been "totally discredited." In fact, longer-term data establishes a warming trend, and the scientific consensus behind human-driven climate change remains intact. Science 150: Arctic Sea Ice. Purporting to correct comments made by Al Gore about the impact of global warming on the North polar ice cap, Beck falsely claimed that Arctic ice "has returned." In fact, 2008 and 2009 were the second- and third-lowest years on record for summertime Arctic sea ice, and the National Snow and Ice Data Center has stated that the data from the past two years are consistent with the long-term negative trend that will result in ice-free summers for the Arctic Ocean. Science 250: Carbon Dioxide and "Lies." On the April 21, 2009, broadcast of his radio show, Beck asked, "[H]ow could carbon dioxide be a poison when it's naturally occurring and the trees use it to grow?" He added: "Stop. Just stop, will you? Stop with the lies." Beck has also repeatedly mocked the idea that carbon dioxide is a pollutant by exhaling and stating, "Look how much pollution I just put out," and, "I'm going to harm the planet. I'm going to give some CO2 off." However, scientists have pointed to the danger posed to the atmosphere by excessive discharges of C02. For example, the Natural Resources Defense Council has noted that "a pollutant is a substance that causes harm when present in excessive amounts. CO2 has been in the atmosphere since life on earth began, and in the right amounts CO2 is important for making the earth hospitable for continued life. But when too much CO2 is put into the atmosphere, it becomes harmful. We have long recognized this fact for other pollutants." Science 300: Speculative Immunology. On his September 30, 2009, radio broadcast, Beck stated that he wasn't willing to make a recommendation on either taking or avoiding the H1N1 vaccine because "it can lead to a lot of death one way or another." He continued: If "I say, 'Everybody take the vaccination,' and that turns out to be deadly, what role did I play in that?" On the same program, Beck suggested that the vaccine could cause "neurological damage" and said that "[i]f somebody had the swine flu right now, I would have them cough on me. I'd do the exact opposite of what the Homeland Security says." Beck ignored the consensus of actual scientists from the Centers for Disease Control and Prevention, National Institutes of Health, World Health Organization, Johns Hopkins, and the Department of Health and Human Services that the vaccine was safe. Geography 200: Middle Eastern Cities. Beck criticized White House adviser John Brennan for referring to Jerusalem as "Al Quds." Brennan had stated: "In all my travels, the city I have come to love most is Al-Quds -- Jerusalem." Beck complained that if Brennan hadn't "just said it," then he never would have "heard of Al Quds." Beck continued: "It is the Arab name for the city of Jerusalem. ... If you're talking to a bunch of -- I don't even know, Muslims, Arabs -- whoever you're speaking to -- you could say, 'The city I love the best is Jerusalem -- Al Quds.' You give the tip of the hat to the other direction. You don't just buy into the fact that Jerusalem's name isn't even Jerusalem." Other political figures -- including a former member of the Reagan administration -- have referred to Jerusalem as "Al Quds." Economics 150: Debt and Deficit. Beck attributed the entire deficit for Fiscal Year 2009 to President Obama, stating that the federal debt was "$10.6 trillion in 2008," and that since Obama "comes in," "we've gone in the one year, we've gone to ... $12.3 trillion on the debt." In fact, only a small portion of the FY 2009 deficit -- which totaled $1.4 trillion -- was due to Obama's policies; in January, before Obama took office or signed any legislation, the Congressional Budget Office projected that, based on policies set under President Bush and economic conditions at the time, the deficit for FY 2009 would reach $1.2 trillion. In addition, the Center on Budget and Policy Priorities stated that "the tax cuts enacted under President George W. Bush, the wars in Afghanistan and Iraq, and the economic downturn together explain virtually the entire deficit over the next ten years." Economics 200: Economic Recession and Stimulus. Beck advanced the myth that no jobs have been created under the stimulus and baselessly claimed that its "intent to restore the economy ... [is] not working either." In fact, independent analyses of the stimulus, including those conducted by Moody's Economy.com and the nonpartisan Congressional Budget Office, had estimated that the American Recovery and Reinvestment Act increased employment by as many as 2.4 million jobs by the end of 2009 and added to real GDP growth in the second, third, and fourth quarters of 2009. Economics 400: The Laffer Curve. On his April 12 Fox News show, Beck hosted former Reagan administration economist Art Laffer to discuss his theory that increases to current federal tax rates would decrease federal revenues. But Laffer's theory has been widely discredited -- with Bush administration economist N. Gregory Mankiw calling it not "credible," and numerous Bush administration officials acknowledging that tax cuts produce a net decrease in revenue. Spelling 100: An Introduction to Orthography. On his August 27, 2009, television program, Beck attempted to spell out "oligarch" by circling the first letter of each word in a list on his chalkboard. "O-L-I-G-A-R-H," said Beck, and then, seeming to realize his mistake, he admitted, "One letter is missing." A moment later, however, Beck explained to his audience which letter he though was missing: "Oligarch. The one that's missing is Y." Beck triumphantly added a "Y" to the chalkboard, leaving us with "OLIGARHY" as a description of his perception of where the country is headed. The next day, Beck acknowledged his mistake and said, "[W]hat we were missing yesterday was 'czars.' ... You can't spell oligarch without the czars." Literature 200: The Juncture of Fiction and Reality. During a June 22, 2009, segment on ACORN, Beck put up a graphic of "all the people that are really big" in the organization. As Beck himself quickly realized, the graphic included the fictional character "Silas" from The Da Vinci Code. Culture 200: The Civil Rights Movement: New Interpretations. Beck has complained that progressives have "co-opted" the civil rights movement, yet he is adept at co-opting the movement himself. He has repeatedly drawn comparisons between himself and civil rights leaders like Martin Luther King Jr. and has said that his August 28 rally -- which takes place on the anniversary of King's "I Have a Dream" speech -- will "reclaim the civil rights movement." He has compared activists who protested against health care reform to civil rights marchers, advocated opposing health care reform while showing pictures of fire hoses turned on civil rights protesters, and has stated that he wouldn't be "surprised" if "dogs and fire hoses are released or opened on us" or if "some of us go to jail, just like Martin Luther King did." Beck has stated that "we are not getting up from the counter" and "we are not going to sit in the back of the bus" and has claimed that his followers "are the inheritors and protectors of the civil rights movement." Perhaps most egregiously, Beck has criticized Rep. John Lewis, who is recognized as a major leader of the civil rights movement along with King, for "comparing" himself to civil rights activists. Culture 350: Political Analysis of Popular Music. Beck has provided samples of what a Beck University course on popular music analysis might be like. You might learn, for example, that Bruce Springsteen's "Born in the USA" is "anti-American." "Communist" Woody Guthrie's "This Land is Your Land" is secretly about a "progressive utopia where there are no owners of anything." Best of all, the Beatles' "Revolution" apparently "spell[s] it all out." What is "it?" Progressives' plan to slowly institute Marxism, of course. Drama 100: Performance Art. On his April 9, 2009, Fox News program, Beck "demonstrate[d]" how he felt about the Obama administration by casting Bill Schulz from Fox News' Red Eye as "the average American" and himself as Obama. Beck proceeded to pour liquid from a gasoline can over Schulz while bemoaning the budget, Social Security, Medicare and Medicaid, supposed cuts in national defense, debt, Guantánamo, terrorism, Cuba, and immigration. He then requested matches and asked, "President Obama, why don't you just set us on fire? For the love of Pete, what are you doing?" In a September 2009 segment, Beck pretended to boil a frog in order to illustrate that "we've been tossed quickly into boiling water."